I watched an entertaining show the other day. On a solid, smooth log in the forest, I took my front row seat and settled in to enjoy the action. We are in the middle of fall, that aptly named season when nature reminds us that death too can be beautiful. For several weeks past and for several more to come, the leaves on the maples, oaks, hickories, and others are letting go into death, their work of capturing sunlight and nourishing the trees complete. I looked about me, enjoying the forest’s calm that always soothes me. Then my eye caught the movement of a dry, curled form, broken loose from high above and drifting down, wafting a little this way, a little that way, until it reached its resting place on the ground. The course of the leaf’s fall reminded me of lightening; seldom does it take a direct route to its destination. A few moments later, another leaf began its descent. I watched as it lazily made its way down. And I laughed out loud as it landed on its edge, perched there for a moment, and then fell over to lie flat, unmoving, among its fellows. No fair! Now two leaves were falling at the same time! My eyes, darting back and forth in my attempt to watch them both, focused on neither, and I missed out on really observing either one. Looking up, I noticed a curled leaf falling from a high chestnut oak branch. But after only a few yards, the oak leaf’s journey was halted prematurely. Catching in a tangle of leaves still attached to a branch below, the leaf will rest there awhile, until a breeze comes along and sends it on its way again. Very near my log I noticed a shrivelled red leaf bobbing near a tip of a twig extending from a tiny, young red maple tree. But the leaf was not even attached to the twig! It appeared to be fluttering about in the air, all on its own! Only when I got up and peered closely at that space between the little dancing leaf and the tip of the tree could I see that the thinnest of filaments was holding the leaf in proximity to the tree. Was it a spider’s thread? I don’t know, but it held the leaf firmly, despite all the leaf’s shaking. This leaf too would have to wait to reach its final resting place. The sight of the dead leaves making their unique journeys to the earth was accompanied by another pleasure–the sounds they made. Sitting on my log, I sometimes heard a light scratching sound as a leaf brushed past other leaves or branches on its way down. And when the newly fallen leaves reached those who have gone before, on the ground, the sound of their meeting was dry and soft, a pleasing whisper. I recently had the opportunity to research and write about a particularly incredible place on our incredible planet. It is Lake Baikal, the oldest and deepest lake in the world. Part of my fascination for the place stems from my love of nature and the many marvels that are part of this lake’s ecology. I am also fascinated by all things Russian. My college study of the language left me with such a great appetite for Russian land, history, and culture that, if I believed in past lives, I would be sure I had once been a Russian. Lake Baikal is located in southeastern Siberia, a place that I once pictured as a mostly frozen, always cold wasteland. After all, it was where the tsars and the Soviet government banished all the people they wanted to be rid of. But Siberia is not a frozen wasteland. It includes towns, even cities and industry. It has a rich human history and great natural diversity. Unlike most of the world’s lakes that were formed in the neighborhood of 10,000-100,000 years ago, the crescent-shaped Lake Baikal is 25 million years old! It was formed by a deep separation, or rift, in the earth’s crust. The rift continues to widen about two centimeters a year. The lake, which has been designated a UNESCO World Heritage Site, is so large it contains 20% of the world’s fresh water. Known as “the Galapagos of Russia,” Lake Baikal is an astonishingly rich ecosystem. In fact, of more than 2,600 known species of plants and animals in and around the lake, more than 80% of them are found nowhere else on earth! For example, the nerpa is the world’s only freshwater seal, and it lives only in Lake Baikal. And the omul salmon, widely regarded as Lake Baikal’s tastiest fish, is found nowhere else. Many other species of fish, crustaceans, snails, and worms are also endemic to Lake Baikal. The two main reasons for the extraordinary biodiversity and huge proportion of endemic species in Lake Baikal are the lake’s extreme age and its isolation. Scientists believe that with 25 million years of evolution, as opposed to just thousands of years as with most of the world’s lakes, the species inhabiting Lake Baikal have simply had time to evolve much further. Besides, Lake Baikal has been largely cut off from surrounding areas because of the high, steep Barguzin Mountains that surround the lake. Thus, Baikal area species have evolved with little contact with similar species beyond the mountains. These forested mountains around the lake are home to bear, mink, sable, reindeer, ermine, moose, and many other species, some of which have become extinct in other areas. Fortunately, much of Lake Baikal’s shoreline has been protected with national park status by the Russian government. While this “jewel of Siberia” has received some important national and international protections, it has nonetheless been affected by pollution. Industrial pollution, entering the lake’s southeast end from the Selenga River, as well as from other sources, has led to reductions in many species. Fall seems to be the time of year when I notice the walking stick. This long, super slender, light brown insect looks very much like a twig–with legs. Lately I have been seeing these critters here and there, always completely still, attached to one of the sliding screen doors to our house, to a tool shed wall, or to a deck post. Often, I will notice the same walking stick still clinging, unmoving, to the same spot hours later. I have been curious about these insects, so I decided to do a little research. I learned that more than 2,500 species of walking stick are known to exist, and they are found throughout the temperate, and especially subtropical and tropical parts of the world. Walking sticks live all over the U.S., although they are more abundant in the southern half of the country than in the northern half. As you might expect from the walking stick’s strong resemblance to a twig, both in shape and color, camouflage is the name of the game when it comes to survival strategies. I am pretty sure that the reason I notice these insects on our house and shed but not on the trees is simply that the ones attaching themselves to trees are so well camouflaged that I fail to detect them. But when a walking stick really wants to hide, it can draw in its legs, so that they are parallel to and flush with its body. The walking stick then stiffen its body and drops to the ground. There it may remain motionless, a dead twig, unnoticed by predators. Not only is the walking stick able to ‘impersonate’ a dead twig on the ground; it can even imitate a twig moving slightly in the breeze! The insect achieves this feat by flexing its legs, which causes its body to sway slightly from side to side, just as a twig might do in a breeze. Camouflage is also a key ingredient in the walking stick’s reproductive process. For example, the eggs of many walking stick species look very much like the seeds of the particular species’ main host plant! The female lays her eggs in the fall, one at a time. She lays from one to several over the course of a day. An egg may stick to a leaf of a tree or bush where she has attached herself, or an egg may simply fall to the ground. Eggs are likely to hatch the following spring, but eggs may wait as long as years. if necessary, until conditions are right. A walking stick typically lives for about a year. Even if the female lacks a male partner, she can produce fertile eggs. And these eggs are always female. In fact, only one in 1,000 walking sticks is a male, scientists say. Walking sticks are herbivores. In the spring the newly hatched nymphs feed mainly on understory shrubs. As the nymphs mature, they eat throughout the crown of their host plants. Among the many common trees favored as host plants by walking sticks in the U.S. are apple, basswood, birch, dogwood, hackberry, hickory, locust, oak, pecan, and wild cherry. Walking sticks often feed during the nighttime hours in order to evade detection by their predators, who include many birds, reptiles, primates, and bats. But the walking stick’s nocturnal strategy and its camouflage do not work with bats. Thanks to their echolocation or ‘radar,’ bats can relatively easily detect the whereabouts of a walking stick. The world’s two largest protected marine areas are now joined in a partnership that will enhance the conservation of 300,000 square miles of the Pacific Ocean. One of the two areas, the Papahanaumokuakea Marine National Monument, in the northwest Hawaiian Islands, was made a U.S. national monument in 2006. Encompassing 140,000 square miles, the monument was, at that time, the largest protected marine area in the world. The monument’s coral reefs are home to 7,000 marine species, one-fourth of which are found only in the Hawaiian Archipelago. The other protected marine area is the Phoenix Islands Protected Area, an archipelago in the Republic of Kiribati (pronounced Kee-ree-boss), located near the Equator. When it was set aside by the Kiribati government for special protection last year, its 158,500 square miles of ocean and islands became the world’s largest protected marine area. The coral reefs and bird populations of the Phoenix Islands are unique and have been hardly touched by humans. Representatives of the U.S. and Kiribati governments met in New York on September 29 to sign the agreement to jointly manage the two sites which, together, comprise 25% of all protected marine areas in the world. The two sites provide “ocean insurance for the Pacific against the depletion of marine life that has accelerated across the globe,” added the Republic of Kiribati’s director of the Phoenix Islands Protected Area Tukabu Teroko. “Together we can more effectively address the complex challenges of managing such large ocean areas,” he added. By silver weeds in a silver stream. I have just learned about the international organization 350.org. Its mission is to get people all over the world to take action to help stop the harmful warming of our planet. Why the name ’350.org?’ Scientists say that 350 parts per million of carbon dioxide (CO2) in the atmosphere is the highest safe limit for humanity. But the carbon dioxide now in our atmosphere is an alarming 385 parts per million (ppm) and rising. According to climate experts, if we do not act quickly to bring the proportion of carbon in the atmosphere back to 350 ppm or lower, we risk reaching tipping points and irreversible impacts such as the melting of the Greenland ice sheet and major methane releases from increased permafrost melt. Already, major life systems are in decline, and weather patterns are increasingly erratic. Unless we successfully address global warming, we are all in deep trouble. So what can you do to make a difference for the planet? You can join with people in more than 140 countries who are observing the Day of Action, Saturday, October 24. Organizers with 350.org are asking people all over the world to organize an event at a central site in their community and incorporate into it the number 350 and then to upload a photo of the event to 350.org’s website. The organization will deliver all the photos to world leaders and the media to show, before December’s decisive climate change talks in Copenhagen, that people all over the globe demand decisive action by the world’s governments to address global warming. It doesn’t sound hard. And people are planning all sorts of activities: marches, bike rides, and rallies in cities and on campuses; teach-ins; creating a human line along coasts where global warming means higher water levels; river and beach clean-ups; service projects like building weatherization and improving bike trails; and much more. These actions can all be valuable in attracting the attention of the community and in educating people. Planning an event for the day of Action will spread the word about the meaning of ’350′ and why we must all get involved in lowering the carbon dioxide in our atmosphere to 350 ppm. Looking around me, it seems clear that life is the driving force on this planet. Was it Darwin who said that nature abhors a vacuum? I learned from reading his Origin of Species that any niche or ‘vacancy’ in the natural world will be filled. Life always pushes forward, begetting more life. And life finds ingenious ways to surmount obstacles, to adapt and change if necessary. I think of Albert Schweitzer who observed that all beings, even the tiniest, strive to live. The life force drives us all. I was reminded of life’s persistence this morning when I took a stroll into the woods. Not very far down the hill was the stump of a chestnut oak tree. It was very old. The diagonal cut that had severed the tree from its base has smoothed, darkened, and the perimeter of the cut has rounded with time. The stump’s bark is covered with the green of lichens that have made the stump their home. To my surprise, the stump was the center of a formation I had not seen anywhere else. Surrounding the stump was a wide, thick, brushy ‘wreath.’ So large and wreath-like did it look that I could imagine its having been removed from a giant’s door and placed on the ground circling the stump. What is this ring about, I wondered. As I looked closer, I saw that it was largely made of woody sprouts, or suckers, hundreds of them, shooting upward all about the stump. The suckers appeared to have been clipped at the top, perhaps by hungry deer. But as I dug through the dry, brown leaves that had collected in the ‘wreath’ and that gave it its full, wreath-on-the door look, I found here and there small green chestnut oak leaves growing from the suckers. This stump, ‘killed’ so long ago, and that looked so dead, was alive! It was trying to reclaim its ‘treehood,’ as it reached toward the sun from all around its base, as it continued to make leaves. Another stump, a dead one, I am sure, was supporting life of a different sort. This stump, cut in such a way as to just miss being a nice little chair, serves as home, now to one type of fungus, and now to another. For the last several weeks, I’ve noticed that plump, firm, off-white fungi seem to burst from the long-ago cuts that had rendered the tree into a stump. One of the growths seemed to squeeze forth from between two closely made cuts. As I examined these recent growths, I recalled that the stump had looked different not long ago. Then, it was another fungus’s turn. Instead of plump, firm fungi living in its cuts, the stump then supported thin, rubbery brown striped ‘turkey tails,’ marching up one side of the stump in a surprisingly even line. Walking farther into the woods, I noticed that the same thing was happening with the dead logs littering the forest floor. 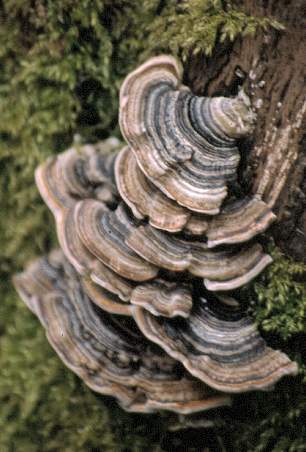 They too have become a source of life for several kinds of fungus. Pale green, leafy-looking growths dotted one log, and tiny white fans followed a furrow along the bark of another log. And many logs were brushed with patches of pale green lichen. As I was looking about, I did a double take. What was the dark, round form encased in a very dead, driftwood-like formation just a few feet away? Nestled tight between the earth and a cave-like curve in the dead wood, it turned out, was a darkened and dead basketball. How long had it been there, I wondered? How many years ago did the ball slip from a child’s hand and roll down the hill, to be caught and sheltered until now in some dead tree’s grasp? You are currently browsing the Earth Connection blog archives for October, 2009.